In the first part of this series, I explored in historic perspectives (particularly with developments in Oromia regional state) the Ethiopian government’s road to becoming a counter-protest state and the systematic ways in which the regime further bolstered its role as a counter-protest state. And in the second part I discussed about the surge of popular protests in Ethiopia focusing on the socio-political and party architecture in which the ongoing Oromo protests first took shape. In this third, and last, part I will take a close look at the decades-old simmering tensions between the Oromo nation and successive Ethiopian states, discovering what they reveal about the contemporary politics of the Ethiopian counter-protest state vis a vis its relations with the Oromo protests, which, by several measures, have reached a point of no return. Continuous confrontations and tensions between Oromo protesters and the ruling party manifested in Oromia-wide Oromo protests may not be understood fully unless we look back its history. In order to contextualize the on-going Oromo protests, we must consider decades of relationships between the two confronting parties – the Ethiopian state and the Oromo nation – discovering what they reveal to us about the politics of the Ethiopian counter-protest state, and what they suggest about the future prospects of Ethiopia’s political trajectory. It is indisputable that this massive movement in Oromia is not simply a political phenomenon whose root is limited to the period between 2006-2015; it goes as far back as the 1960s when modern Oromo political activism was born, and even goes as far back as the formation of the Ethiopian state itself. Yearning since the 1960s for three overarching questions – language, land, and self-rule – Oromo nationalism has been growing more than ever since the introduction in Ethiopia of the multi-national federalism in the early 1990s. While the Oromo question for land has two parts: the homestead (qee’ee) and the Oromo country (biyya-Oromoo), the issue of language became the foundation of identity question. The third, the Oromo question for self-rule in the course of their national struggle, seemed to have been conceived as an ultimate solution capable of addressing the other two. These three overarching Oromo questions were aired in the 1960s by the Oromo members of the Ethiopian student movement and the Maccaa-Tuulama Self-help Association, and were later on articulated in the early 1970s in the political program of the Oromo Liberation Front (OLF). These questions have been dealt with piecemeal in the revolutions of 1974 and 1991. The 1974 revolution succeeded in the promulgation and implementation of a proclamation answering the country’s pressing demand, which was coined through the famous slogan of the student movement – “land to the tiller”; it was able to return plots/homestead to individual peasant households. With the Oromo in view, the 1974 revolution answered the question of qee’ee (homestead) but it had never attempted to deal with the Oromo question of yearning for biyya-Oromoo (Oromo country). Instead it criminalized the demand presenting it as a treasonable crime. The revolution also addressed the Oromo identity claims by allowing some media outlet for Afaan-Oromoo (Oromo language) but the demand to use Latin alphabet (qubee) was made another treasonable crime. The political change in 1991, however, went far beyond the offers of its predecessor and dealt with more fundamental issues. Demands of Oromo nationalism was legitimized and institutionalized within the state apparatus when the new regime – for the sake of its own legitimacy – decided to offer concessions to decades old national struggles. Through the federalism arrangement, it created the long sought after Oromo country within Ethiopia in the form of the Oromia National Regional State with its own regional parliament, Caffee Oromiyaa. It also allowed Afaan Oromoo, which had long been criminalized and heavily suppressed under the imperial and socialist Ethiopia, to be recognized as the medium of instruction in schools throughout Oromia. But as the rule of the TPLF/EPRF began to unfold the problems inherently linked to its system of rule started to unearth. When in 1991 a coalition of rebels overthrew the Derg, the victorious TPLF-led-EPRDF not only took control of the capital city, expanding daily at the expense of Oromo farmers, but also inherited one of Africa’s oldest authoritarian state form, effectively excluding from the country’s politics, economy and cultural manifestation most of the southern peoples (the Oromo included). As soon as TPLF took control of the center, a dubious, rather feckless Transitional Government of Ethiopia (TGE), where various political groupings, including Oromo parties of which the Oromo Liberation Front (OLF) was prominent, was organized in 1992. Perhaps as part of its concerns to take the OLF on board, the TPLF recognized Addis Abeba as the capital of Oromia and promised that the interests of the Oromo people in the city would be accommodated. However, the whole scheme boiled down into a political manipulation where the TGE gained the support of Oromo parties and the people’s support for the creation of a lasting TPLF-dominated authoritarian regime. When the TPLF dominated EPRDF ensured its control over Oromia, it went on to purge the OLF out of the TGE in June 1992. In 1995, when the new constitution transformed TGE into the Federal Democratic Republic of Ethiopia (FDRE), the TPLF dominated government began employing ambiguities in the constitution and walked in earnest to take full control of Addis Abeba. In Article 49, where issues of Addis Abeba have been stipulated, three of its sub-articles (sub articles 2, 3 and 5) present contrary provisions, a state of affairs that made the gate wide open for the ruling party’s looming interests over the city. After appointing a TPLF veteran soldier as the mayor of Addis Abeba in 2000, the regime took a bold decision in 2003 to shift Oromia’s capital from Addis Abeba to Adama, 100km southeast of Addis Abeba. When the office of the Oromia regional parliament, Caffee Oromiyaa, was thrown to Adama it appeared that the hope of the Oromo to have their government in the city they believe is the center of Oromia was dashed. Following the 2003 government decision to transfer Oromia’s seat to Adama the leadership of Maccaa-Tuulama Association (MTA) and Addis Abeba University students immediately organized a protest, which was met with brutal crackdown. The organizers were imprisoned and MTA was outlawed and had its office looted and dismantled. The university itself dismissed nearly 400 students whom it believed had taken part in the protest. While it was clear that thousands of farmers were evicted between 1995 and 2003, it was, however, the decision to transfer Oromia’s capital from Addis Abeba to Adama that gave birth to the Oromo struggle for Addis Abeba. The declaration of the proposed “Master Plan” a decade later would mean dashed hopes and broken promises; it breaks up into two what has been known in the narrative of modern Oromo political activism as biyya-Oromoo (Oromo country), a reference to Oromia. On one hand, it is a broken promise because it sustains the regime’s tradition of deciding on issues relevant to biyya-Oromoo without the consent of the Oromo nation. In fact, many believed the implementation of “the Master Plan” would come close to restoration of the former Shewa governorate-general, which in turn would mean a renewed wave of cultural invasion on the Oromo as much as a territorial break up of Oromia. Addis Abeba’s expansion in historical times had scored the highest record in eviction of the surrounding farmers in its environs, namely, Tuulama Oromo, but the EPRDF regime took this to a new level previously unmatched in Ethiopia’s history. Most peasant households have been and still are poor in Ethiopia but they live on their land and depend on its produce for their livelihoods, whatever its sufficiency. Tuulama Oromo in this regard appear the most unfortunate for encountering endless evictions since at least the 18th century. Left in isolation from the Oromia National Regional State, Ethiopians in all walks of life, and undoubtedly the TPLF/EPRDF regime, the Tuulama Oromo have been forced to bear unbearable projects accompanying the regime’s intent (whatever the name attached to it) of expanding the city of Addis Abeba with no regard to their way of being. The Oromo population constitutes nearly 40 per cent of Ethiopia’s estimated population of 100 million. Some are adherents of Islam (being involved in more than one sect); others follow different sects of Christianity, and still others adhere to Waaqeffannaa, the Oromo indigenous belief system. In rural Oromia, their social organizations exhibit diverse historical experiences and regional patterns. These few remarks help us appreciate the internal diversity of Ethiopia’s largest ethno-nation. Another scholar, John Markakis, wrote, “From the beginning of their historic [population movement] the Oromo did not forge unity above the tribal level, nor did they ever coordinate their efforts for a common purpose. Each tribe pursued its own destiny entirely independent of the others, and inter-tribal warfare was the rule rather than the exception.” Historian Bahru Zewde on his part says “… the incorporation of the nineteenth century has resulted in the denigration of Oromo culture and identity,” but plainly denies the fact that an Oromo country has ever existed before the twentieth century; he argues against a map of Oromo country – Ormania – made by a German missionary J.L. Krapf based on primary historical data he collected ‘during an eighteen-years residence in eastern Africa’ in mid 19th century. While Gebru Tareke and John Markakis have taken Oromo internal diversity far beyond limits, it is fairly recognizable that Oromo internal diversity led to considerable divisions that played key roles not only in their historical experiences with Ethiopian systems of rule but also in creating within themselves fissured political groupings. But the fact that the ongoing Oromo protests engulfed the whole of Oromia in merely three weeks’ time threw some light on the perspectives of these scholars – Gebru and Markakis, for example – who consistently argued against the presence of the Oromo’s nationhood. By claiming that Oromoness is counterfeit, that it never existed, that Oromo nation possess within itself lots of local and cultural diversity to develop any coherent consciousness and never possessed an overarching sense of “nationhood”, or that they are inseparably intermingled with various other peoples, “the opponents believe that they can divide, destroy, or, perhaps, wish away Oromo nationalism,” to use the words of Herbert Lewis, who wrote The Development of Oromo Political Consciousness from 1958 to 1994. While this attitude has clear origins in politics and “interests,” it is facilitated by the general social science discourse that still tends to discount or decry ethno-nationalism. Yet this kind of internal diversity which some scholars employed to question the very existence of the Oromo as a nation is seriously called into question with the start of Oromo protests in November 2015. Many scholars attempted to understand the challenges of the Oromo national struggle in isolation from the political developments in that tumultuous region of Ethiopia and the horn of Africa. But the on-going Oromo movement appears to have overcome lots of deterring factors long-lived in the Oromo national struggle. In less than four weeks what the Oromo people regarded as a serious threat to their national identity caused a union of massive popular movement that engulfed the whole of Oromia. A case in point is how Oromo national identity, Oromummaa, has been built over decades and the significant impact it has in uniting a population of close to 40 million for a coherent cause. Oromoness is a reference to all those features that make up Oromo personality. It is constituted by the entirety of the Oromo culture. It is worth noticing that Oromo activists, artists, political commentators, scholars and politicians appear to have successfully campaigned over the last two decades highlighting the fact that Oromummaa transcends differences in political opinions, religions, and all sorts of background, a concept well articulated in the works of Oromo scholars such as Assefa Jaleta. Apparently placed at a precarious position, many scholarly works need to be revisited; there is a need to further investigate facts and collect empirical data to create effective analytical frameworks capable of capturing the whole, more nuanced scenario that would help us better understand the Oromo nation and its indisputable place in the Ethiopian state. Only then can we appreciate and understand why and how various Oromo politicians chose to establish different political parties after the onset of the 1974 revolution; have decided to join rival political groupings not founded for separate Oromo cause; have even joined the dictatorial military regime – a clear indication that even those of similar social and religious backgrounds understood Oromo problems differently and likewise proposed disputing routes of political struggle. 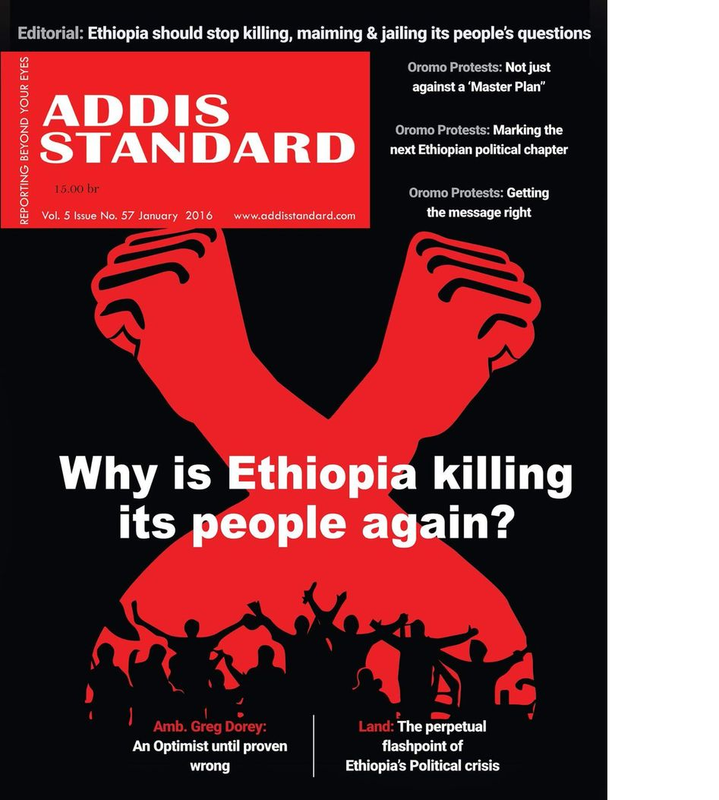 Only then can we clearly comprehend why Oromia has in the last quarter a century exhibited spatial and temporal mismatch on concerns of opposition to the EPRDF regime. Without readjusting our existing narratives it will be hard to understand how and why the 2014 and the on-going Oromo protest movement overlap and deviate. Our understanding of the cultural and socio-political stances that are being taken through the Oromo protests movement can also be appreciated when placed into context with issues related to the wider Horn of Africa. A more accurate contextualizing of these stances can be viewed within the affairs of Ethiopia’s broader issues, and their complexities. The same understanding appeared to have been useful to inform narratives shaping the future of the Oromo national struggle. The days of hiding behind Oromo internal diversity as Ethiopia’s numerical majority with subaltern political constructs are gone, and will not come back again. It is also incumbent upon us to understand that taking opportunities offered in the current multinational federal system, Oromo youth at secondary schools and junior colleges throughout Oromia, and the ever expanding universities have for the last two and half decades propagated their literature, folklore, music, songs, poetry, theatre, drama, and other forms of cultural revival and actions in these concepts of the Oromo cultural movement. Taking into account the growth of federal universities from less than five when TPLF/EPRDF took power in 1991 to over 30 in 2015, it becomes important to see the relationship between this considerable expansion in higher education and the growth in modern Oromo political activism. While ‘economic solvency’ remains one of the fundamental points of the Oromo people’s opposition to ‘the Master Plan’, for the growing Oromo consciousness it is by no means comparable to the Ethiopian regime’s project of posing immeasurable challenges to the concept of Oromoness altogether, and all of what it means from the central parts of Oromia, the territory the Oromos believe is “handhuura-Oromia” (Oromia’s bellybutton). Understanding this is at the same time one of the pillars in symbolization and conceptualization of Oromoness in the minds of the Oromo people. It is such understanding of Oromoness which seems to have brought the new generation of OPDO, discussed in part two of this series, to openly speak against “the Master Plan” in April 2014. There is little doubt that the Oromo nation conceived ‘the Master Plan’ as a threat to their national identity. Styled after popular Arsii tradition, “namni lafa hinqabne, nama lafee hinqabne,” (a person without land is a person without bones). After nearly five decades of struggle, the Oromo seem to have learnt from experience and history that an attack on one part is an attack on the whole. Collective memory helps a society to understand both its past, present, and by implication, to imagine its future. It is important to underline here that it is the memory of past injustices and the contemporary aims of the TPLF/EPRDF regime against the future of the Oromo nation that has served as one of the most important tools stirring the ongoing protest. The Oromo protesters believed that “the Master Plan” violates the territorial integrity and identity of the Oromo and their aspiration to become a self ruling nation. In the perspectives of the protesters rallies across Oromia are rallies for self-defence. The progress of Oromo nationalism over decades appear to have succeeded to present the cause of the Oromo of the central region as the cause of all. While the government employs the same old narrative of “we have made it possible for Ethiopia’s oppressed nations for the first time to use their own language and exercise their cultures,” public political consciousness seems to have navigated far ahead of this narrative. As protesters have proved for themselves through their practical experiences that the regime has very little room for implementation of provisions in the same constitution drafted and promulgated under its own dominance, they took up constitutional provisions as weapons against it. In short, the constitution has become for the Oromo protesters what James Scott theorized as “weapon of the weak.” As the protests set out to start the systematic use of provisions in the constitution by dissent voices within OPDO, the protesters and the opposition became united. It is mainly in this sense that the regime’s propaganda to present the protesters as “terrorists” and “anti-peace” failed to bear fruit. The struggle for Addis Abeba and the adjacent territories presents the Oromo people with a choice between survival and annihilation as a cultural unit and as a nation. It is this understanding that managed to mobilize the entire Oromo nation throughout Oromia region and tested the limits of the counter protest state that Ethiopia is. It is also a hope of millions of Oromo and many more that it is upon the Oromo national struggle to give birth to an efficient national political narrative that, while not compromising unanswered historical questions in Oromia, gives rise to a country-wide coalition of political parties that can realize the old democratic demands of the peoples of Ethiopia, a state of affairs Ethiopia had missed to realize at many historical trajectories. Despite age-old terrains of relations among various groups of peoples in Ethiopia and the Horn, and where the Oromo people deeply and actively involved themselves for generations, Oromo struggle is a struggle for self-rule as well as one for democracy, struggle for both group and individual rights. Signs of overcoming disagreements and standing together for common cause are being observed at this point of the Oromo national struggle. Appreciable is unequivocal banners carried out by Amhara protesters in support of their Oromo brethren and statements made by some Oromo and Amhara political parties and dialogues initiated by their respective media outlets. TPLF/EPRDF’s approach of facing popular protests with bloody crackdowns is no longer keeping Ethiopia as a state. 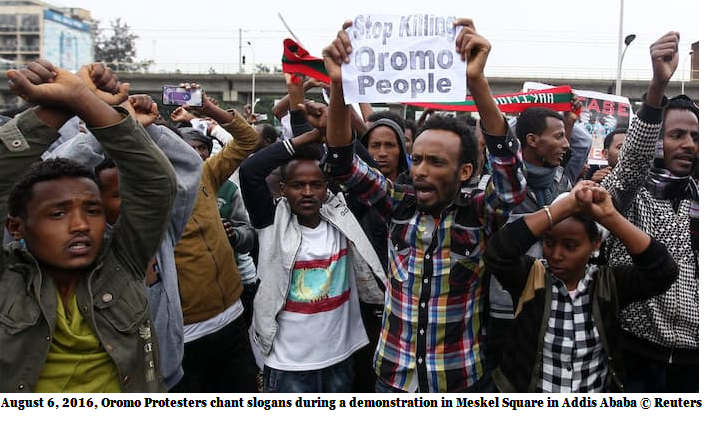 The persistence of the Oromo people in the face of the counter protest state’s ruthlessness will also soon begin to reflect itself within the Horn of Africa’s fragile peace and stability position. Any concerned party, be it domestic or international, which takes seriously the Horn of Africa’s peace and stability, must not only understand the framework of today’s popular demands (that refuse to turn back in Ethiopia’s Oromia region), but must also become grounded in the particular historical contexts of this framework.